Following the publication of Sharpe Practice, Mike Hobbs and I were discussing the possibility of adapting some of the ideas regarding jump-off points from those rules, along with some ideas we had seen from playtests of Fighting Season, perhaps with the goal of writing an official supplement for Chain of Command for the Vietnam War – I even went as far as to discuss the idea with Nick Skinner. However, about the same time, Jason Sendjirdjian started the Wargaming DMZ blog, and started to publish what he was working on. The work he was doing looked good, so we decided to shelve our plans – although some ideas may see the light of day as Jason has taken a slightly different direction to some of our designs. 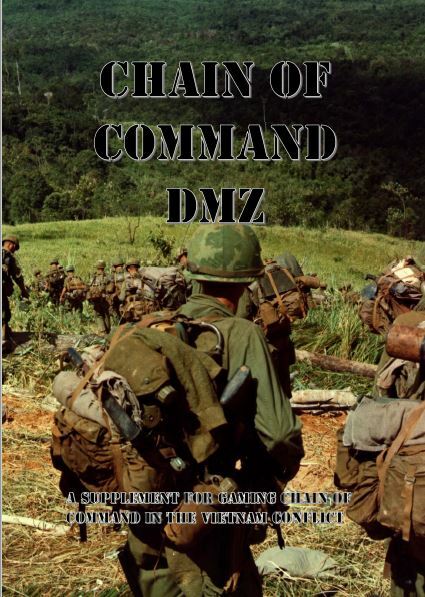 Jason has now published his work as a 41-page free-to-download PDF – Chain of Command DMZ. So, if you fancy using Chain of Command for gaming Vietnam, I recommend that you give this publication a look. Hi Neil, thanks for the kind words. I would definitely be interested in hearing your ideas on design. The supplement can always be changed, adjusted or added to as needed and I am always open to suggestions. I did indeed – oops! Vietnam would be a perfect application for the jump off points, given the tunnels popping up, and helicopter drop zones. Looks fun!